We have a small group of friends that has started getting together monthly for a supper club. This past Friday night, it was our turn to host (and shockingly, it was our first time of even attending this months-old gathering ... we were out of town all of the other weekends when it was held!). Friday nights for me and Ian are always pretty low-key. He's just come off of a long work week and is ready for some R&R, and these days with being a big ol' pregnant lady chasing around a spunky toddler, I'm all about relaxed Fridays as well. 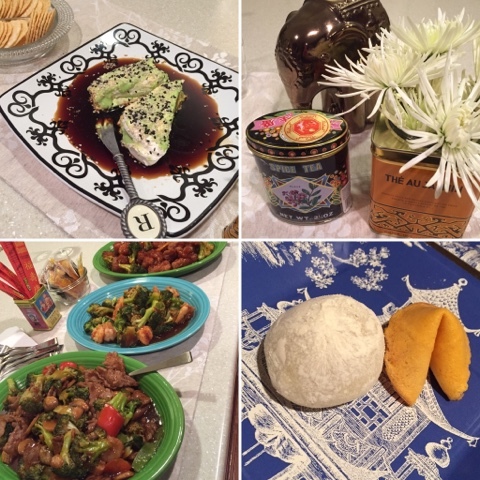 My friend Sarah recently heard of a friend who relied heavily on Chinese take-out for her supper club, so I completely swiped that idea and ran with it! 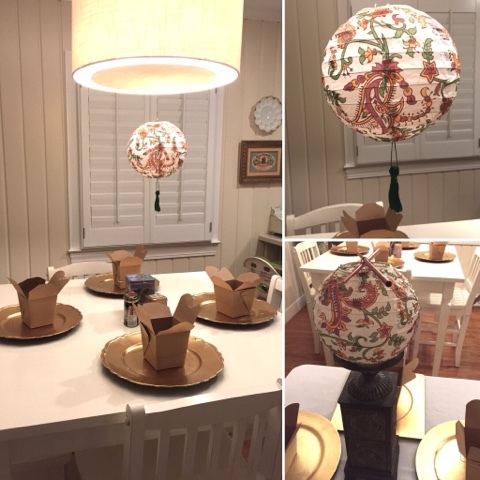 I didn't do any wild decorating, but I did have some old paper lanterns from Pottery Barn that I whipped out for the occasion. One hung from our light fixture with a homemade tassel at the base, and the other was propped on a large candlestick on a card table and finished off with chopsticks on top. I also had some old Chinese tea tins that I picked up in Chinatown while on a NYC trip several years back. We had these on the tables at our wedding reception, so it was fun to use them again! We ate out of cardboard takeout boxes that I picked up at Michaels which was a) CUTE and b) DISPOSABLE! It was so wonderful to end the evening just cleaning off the serving dishes and not having to also wash ten dinner plates. All in all, it cost probably $75 (outside of the wine, Perrier, and beer we had for everyone) and while that is pricey, $7.50 a person for Supper Club is pretty darn good! I know that may be odd to share the cost, and I'm not trying to be tacky or gauche, but I think people like to read about those kind of things and see that it is perfectly possible to host a dinner party for 10 without breaking the bank (or your back ... takeout was an AWESOME choice!). The takeout boxes were around $10 and I had another $10 in flowers from Trader Joe's. Great idea and love you for keeping it real! What a great idea and delicious! What a cute and GREAT idea! I appreciate you keeping it real, you don't see that often anymore! I love the this idea! Our friends and I, couple or no couple, we have a family dinner every Sunday night! We have done it 3 times so far and we absolutely love it! It sounds delicious and like so much fun! Thanks for keeping it real; I think everyone is watching costs and their time! Chinese takeout is ALWAYS the way to go. Love it! This is a great idea! Fun and easy. It is great that there was minimal prep and cleanup - those are two things that kill me at 8 months pregnant. Well played! I like your extra touches on the table and hooray for light dish duty. Adorable! What a great idea, and I love that you managed to make it look so chic while still keeping the prep very simple! love this idea!! I'll be borrowing it for sure!! How fun!! We recently got invited to join a couples supper club and this is such a fun idea! And don't worry about sharing the money - it's great to know! I love Chinese- I would have been thrilled to be a guest! This idea is awesome! And again, I love how honest you are about everything. Definitely not tacky at all to share the cost... that's just practical for others who may want to use the idea. Totally genius!! We used to have a supper club and I totally freaked when it was our turn. This is such a great idea. I'm still so sad we missed it! Our chili & potato bar seemed pretty chill, but this would have been right up our alley... We love a calm Friday night with good friends & good food! Love this idea! Supper Club's all about good food and the people you share it with, so I think your takeout idea was fabulous! I am all for easy!